Fashion design has always been as natural to me as breathing: it started in elementary school and, since then, has never ceased to amaze me. My other passionate occupation of that time was the production of eccentric city designs (plans). The above drawings represent my Graduation gown! Actually, Mr. Dimitrelis (owner and head of the Dimitrelis Fashion School of Thessaloniki) insisted that I prepare TWO evening gowns: they were shown at the end of the show. As a special talent (one that, as he put it, the school had not seen in its 32 years of existence-by then) I was required to present double the load. And, it was very expensive! My mother (who, at the end, did all the sewing-because the woman we hired could not work with...patterns!) insisted that I buy the best material. 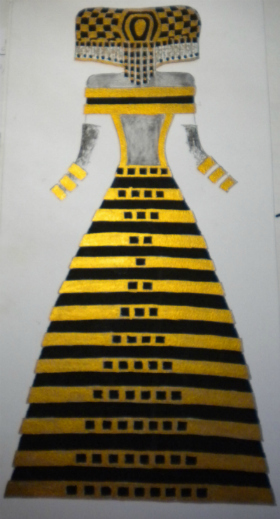 So, it was black taft of the most exquisite quality, and gold for the stripes (also extremely expensive). I have kept this dress: I will never sell it, because it does belong to a museum! It's not an evening gown: it is pure art made of fabric. During my adolescence, and while being extremely busy with the full load of a very demanding school (The American College 'Anatolia' of Thessaloniki) plus the piano lessons at the State Conservatory, I decided I wanted to study fashion design! So, I enrolled in a correspondence course at the Veloudakis Fashion School in Athens. By the end of the course (I was 16 years old by then), Mr. Veloudakis suggested that I send my designs to a fashion magazine for publication. Ι did not do this but, two years later, the fashion magazine GYNAIKA announced a Panhellenic contest for non-professional (young) designers: the winner would then compete at a European level, and three participants would be chosen to work at famous fashion houses in Paris! I entered the competition and was chosen among the first ten. According to the contest's rules, I had to 'realize' my designs: my father came with me, while I traveled to Athens. As "my" fashion model, I was given Efi Mela (the most famous one at that time). I still remember my awe, as I was looking up this immensely tall and impressive woman!!! But, during the interview sessions, I realized that this was not 'my' world: and, since I was a piano student at the same time, I urged my father to return to Thessaloniki before he would have to spend two salaries of his (!!!) for the realization of my three chosen fashion designs. Of course, now I do think quite differently: given the opportunity, I would most certainly invest the time into creating my own fashion line, or at least work as a freelance fashion designer! But, maturity comes later in life! Several years passed and I followed the path of music. Then, suddenly in 1990, I accidentally met Mr. Dimitrelis, owner of the respective fashion design school of Thessaloniki. I told him right there my short 'fashion story' and he invited me to bring my designs to his office. He literally told me that I was a "born-fashion-designer" and I was offered the opportunity to study this subject (a two-year degree) under a unique deal: to pay for ONE year, but attend ALL lectures of both years!!! While this WAS a great (financially at least) opportunity for me, the load of work was truly immense! I ended up with an attendance and work load of about 50 hours per week, just for the Fashion degree! During that time, I was also a full time professor of piano with a weekly teaching load of 20 hours! I did NOT mind the hard work, but I was wondering how on earth I could practice the piano as well: there was just not enough time!!! So, after pondering for about 5 minutes (my usual 'speed' in decision making! 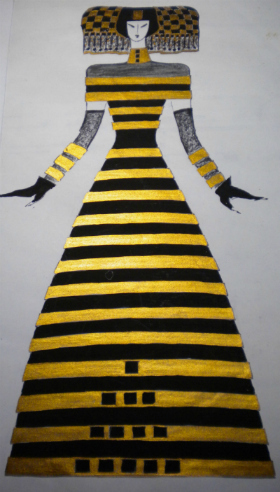 ), I decided that Fashion Design had always been a unique passion of mine that had been largely neglected. I therefore decided that it was about time to take care of this inclination of mine, too! And, before making myself a nervous wreck by trying to fit piano practicing into this horrible load of work, I just 'shut' the lid of my piano for the upcoming 9 months of studies and thought: "well, a baby needs 9 months to grow-this is MY baby now and it needs my full attendance!!!" And, this is how I entered this field officially! The year of my graduation (1993) was under the influence of the 'orient': my inspiration came from the Swayambunath temple of Nepal (the cupola, in particular). One clothing brand starts a popular trend with color block tops or zig-zag stripes; suddenly every store has multiple brands showing similar design features. A company introduces a product that becomes popular and then several other companies or house brand versions are selling something comparable. If a song or book can be copyright protected, can a design on clothing? The U.S. Supreme Court announced on Monday that it will be hearing two cases this year that address whether the design of an article of clothing constitutes intellectual property and can gain copyright protection. The cases before the Supreme Court are ostensibly about cheerleader uniforms and adult diapers, but they take on broader legal aspects of fashion and product design protection. They specifically address whether a design on an article is original enough to gain copyright protection. Ultimately, a Supreme Court decision is likely to have an impact on the entire garment industry, designer knockoff merchandise, store house brands and even merchandising of popular characters and movies. Both intellectual property rights cases will be heard this fall and decided within the next term (Oct. 2016 through June 2017). The first case, Star Athletica v. Varsity Brands, is a legal fight over designs that appear on cheerleader uniforms and athletic warm-up outfits. The lawsuit over the uniforms asks the court to clarify the legal basis for determining if design components on things like clothing can be copyright protected. Current federal copyright law indicates that protection can be granted for “any pictorial, graphic, or sculptural authorship that can be identified separately from the utilitarian aspects of an object.” Otherwise, if the design is part of the basic function of the clothing, it is ineligible for protection. Varsity Brands, Inc., a top cheerleader uniform maker, sued Star Athletica six years ago for infringing on Varsity’s copyrights for five uniform designs that involve placement of stripes, chevrons and color patterns. A federal trial judge rejected the copyright claim saying things like stripes and patterns could not be separated from a cheerleader uniform. The judge ruled that the design elements were the core of what a cheerleader uniform looks like, and not eligible for a copyright. U.S. District Judge Robert Cleland wrote that, without the designs, the uniform “is merely a blank canvas.” The U.S. Court of Appeals for the Sixth Circuit disagreed. The majority ruled that Varsity’s uniform designs qualify as distinctive works and were therefore eligible for copyright protection. The court said the designs of the garments are separate from their function. Even without the stripes, a cheerleader could still cover their body and cheer, jump and flip, the court said. Star Athletica petitioned the Supreme Court to take the case. They argued that the appeals court ruling would mean that garment designers could now claim they deserve copyright protection for button patterns on golf shirts or pleats on tennis skirts. Varsity countered that it employs designers who create new graphic designs based on their artistic judgment. The second case, SCA Hygiene Products v. First Quality Baby Products, involves a dispute over patents for disposable “adult diapers.” The high court will consider whether a subsidiary of a Swedish company that sells TENA brand undergarments, waited too long to file a patent infringement lawsuit against First Quality Baby Products. First Quality makes disposable adult diapers for sale under private labels. SCA Hygiene Products sued First Quality for infringing on its patent in August 2010, but that was almost seven months after the two companies first discussed the alleged infringement. The two companies had actually talked with each other about a possible violation of the SCA patent years earlier. Then, the Swedish firm sought advice from the U.S. Patent and Trademark Office, which reportedly took three years to respond. The issue deals with the idea that someone cannot wait forever to claim there is a copyright violation. In patent law, the holder of the rights has to sue within six years from when the claim arises or loses the right to sue. But the federal courts have concluded that the time could be shorter if the alleged infringer claims the copyright holder was sitting on their hands rather than acting. A federal trial judge ruled in favor of First Quality, citing SCA’s delay in acting, as did the appeals court. SCA, however, appealed to the Supreme Court on the basis of their 2014 ruling in Petrella v. Metro-Goldwyn-Mayer. That copyright ruling allowed someone who had the rights to a 1963 screenplay to claim an infringement from the studio over the 1980 film they made, Raging Bull. The U.S. Supreme Court justices will takes on fashion, product design copyright protection next term. But, the ramifications can be long lasting. And Our Gorgeous Boyshorts Women's Underwear! This special collection consists of clothes that are handmade to order in London, UK! Hire Me as Your Fashion Designer! I am a professional fashion designer (with a degree) having several years of experience in the field. To see my work, just note that I am the senior designer for Sxisma Fashion. My strength is creating women's collections with emphasis in luxury designs. I also love designing women's accessories: from hats, bags, shoes to iPads, notebooks and even home decor! I love interacting with a client in order to create the best possible result according to his/her needs: my imagination is only surpassed by my willingness to cooperate! More Sxisma Fashion pages will be added on a regular basis. You can subscribe to this feed and stay tuned with all the new products (or other interesting web pages) that are coming up! Designing for uniqueness is not an easy task! Being unique is almost synonymous to being original! Presenting our Slim Fit Racerback Tank Tops! Sxisma Fashion Bella Flowy Racerback Tank Tops:this is one of our most favorite tanks! Made from am amazingly soft poly-viscose blend, its flattering silhouette will make you look just amazing!